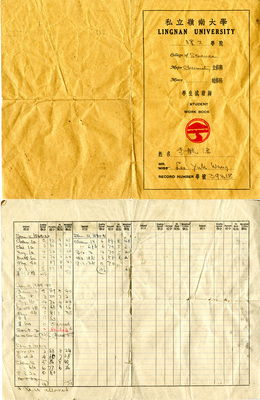 Student Work Book was used to record the academic results of Lee Yuk Wan, student of Lingnan University majoring in Chemistry (Record Number 39318) obtained at 4 separate semesters during 1939-40 to 1940-41. Information of "TO THE STUDENT" and SYSTEM OF MARKING" are available inside the book for reference. Apart from Chemistry, Mr. Lee would also study Chinese, English, Mathematics, Physics, Biology, P.E., Government Studies, and Military Training.